Plaque build-up can lead to tooth decay and gum disease. Thankfully flossing daily can help prevent both. If you know how to floss correctly, plaque and food particles can be easily removed from places that a toothbrush can’t reach (such as under your gums and between teeth). Flossing only takes a couple extra minutes to do and is essential to good oral health, however, more times than not this simple task is over looked. Here are some quick tips on how to properly floss so that you can reap the benefits and keep your smile healthy. It’s first key to find a wax that you like using. There are waxed, unwaxed, Nylon, PTFE, and even electric waxers so find one that feels most comfortable for you and stick with it. 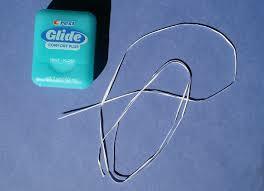 Once you have found a floss that you like, it’s important to use a piece that is about 18 inches long. Wrap most of it around your middle finger of both hands. Use a “shoeshine” motion to guide the string in-between each tooth. When you reach the gum line form a C shape with the floss and follow the contour of each tooth. Be sure to remember to use a fresh section of floss as you move through your teeth. Lastly, remember to be gentle throughout the process. Poor flossing can result in complications so be sure not to rush through the process. In the case that you haven’t been flossing regularly your gums may bleed and be sore for the first week or so. This is often an indication of gum disease or gingivitis. However, usually, as the plaque is broken up and bacteria removed your gums will heal and the pain and/or bleeding will cease. If you don’t have time to floss in the morning always make sure you do in the evening before bed. Lastly, if you feel like you still can’t get the hang of it ask your dentist or hygienist for a demonstration, we are always glad to help .